Because of the super moist Fall (combined with limited time available for gardening), we were unable to work in the garden nearest the house (reserved for carrots, spinach and Fall green beans). Last year, we planted carrots and had so many that some of them stayed in the ground long enough to make seeds that were scattered (by wind) onto the soil. 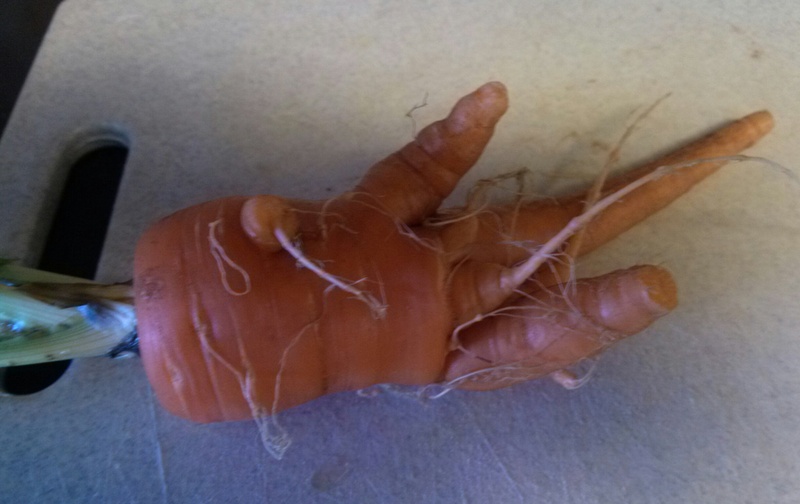 When carrot plants are not thinned out as young plants, they tend to interfere neighboring carrots’ growth and have odd shapes, or develop multiple roots if there is an excess amount of nitrogen. As a consequence, we’ve seen quite a few “odd” shaped carrots — this one (left) is the oddest so far.